Colored scanning electron microscope image showing a superconducting "hot electron bolometer" (HEB) for detection of terahertz radiation. 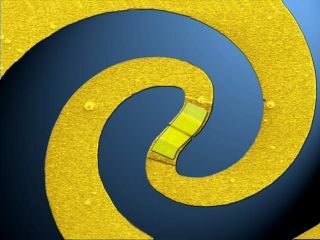 The superconducting niobiumnitride nano-bridge is shown at the center which connects to the on-chip (partly shown) gold spiral antenna via additional contact pads. The strip covering the bridge is a left-over from the processing.